Granola has been labeled “healthy” since the whole health food craze started in the 70’s. People who are associated with the craze and natural foods are even referred to sometimes as “granola.” Although granola is loaded with healthy ingredients, those ingredients are packed with calories. Oats are high in calories, 380/cup. Dried fruit, also a common ingredient in granola averages about 450 calories/cup, and often contains added sugar and/or oil. Nuts are another healthy food which are great to eat, but need to be measured, averaging around 650 calories/cup. Commercial, or even artisan granola brands, contain oil and sugars. Having said all of that, granola contains a lot of calories. The version that I have developed here, contains no refined sugars, and I’ve swapped the oil for whole flax seeds. This granola still is around 550 calories/cup. The point I’m trying to make is that when it comes consuming food, it is really important that you pay attention to portion sizes. A favorite breakfast of mine is 1/2 cup skinny granola (283), 1/2 cup fresh or frozen blueberries (30) , and a 1/2 cup of unsweetened almond milk (30). A healthy and delicious breakfast, coming in at 343 calories! Preheat oven to 300 degrees. 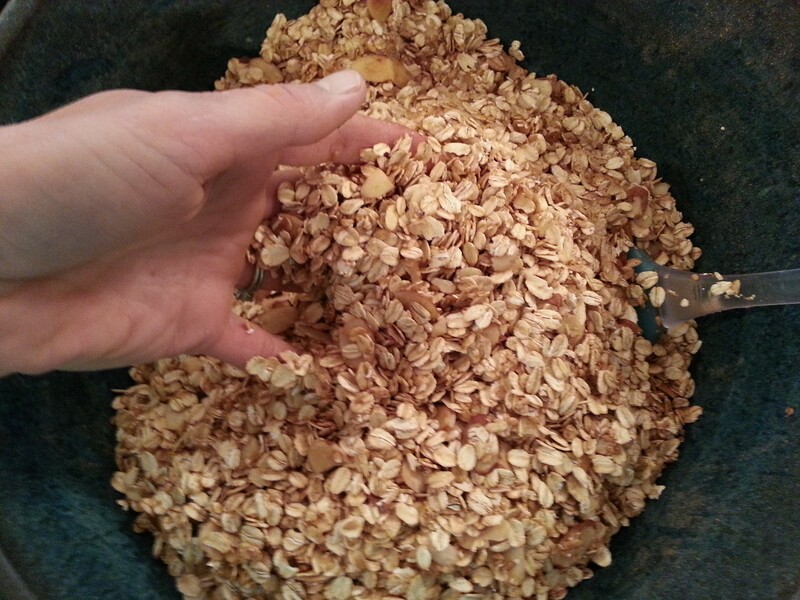 Measure 10 cups rolled oats into a large bowl. Measure 2 cups of slivered almonds. 4 teaspoons ground cinnamon, 2 teaspoon ground ginger, and 1 teaspoon Diamond Krystal kosher salt. Measure the 1/4 cup honey, 2 Tblsp water, 2 teaspoons vanilla extract and 2 teaspoons almond extract into a liquid measuring cup. Stir well with a small whisk or spoon to combine the liquids. Pour the liquid over the oat mixture and mix well with your hands or a spoon until well combined. Spread the mixture in a single layer on to two sheet pans lined with parchment paper. Remove from the oven and toss with a spatula. Return pans to the oven and place on opposite racks. Cook another 15 minutes. Remove the pans from the oven. Sprinkle each pan evenly with 1 cup of raisins. Allow the granola to cool completely. Place in an airtight container for up to three weeks. Makes about 16 cups. 1. Preheat oven to 300 degrees. Measure oats into a large bowl. Measure almonds, flax seeds, ground cinnamon, ground ginger, and kosher salt into the bowl. Stir well to combine. 2. In a liquid measuring cup, place honey, water, and almond and vanilla extract. Using a small whisk or spoon, and stir to combine liquids. 3. Pour liquid mixture over oat and nut mixture. Using your hands or a spoon, stir well to combine. 4. Spread the mixture in a single layer between two sheet pans lined with parchment paper. Place the pans in the oven and cook for 15 minutes. 5. Remove from the oven and toss with a spatula. Return pan to the oven on opposite racks. Cook for another 15 minutes. 6. Remove pans from the oven and sprinkle 1 cup of raisins evenly over each pan. Allow granola to cool completely. Place in an airtight container for up to three weeks. This entry was posted in Uncategorized and tagged breakfast, flax seeds, oat mixture on July 1, 2013 by Katie Fiore. So good–this didn’t come close to lasting 3 weeks–next time I’ll need a double batch! Glad you like it. It’s hard to find granola that’s not loaded with sugar and oil.